Pepperberry Stripped Blue Dress, Midi Length with short sleeves. Size 14. Condition is Used. Dispatched with Royal Mail 1st Class. all saints dress size 14. Condition is Used. Dispatched with Royal Mail 2nd Class. Very good condition. Sleek and sophisticated, this beautiful dress from Hobbs is a twist on a wardrobe classic. Bought but unfortunately does not fit me . Dress can be tied at front or back as shown in photos . I have also added the original listing photos . Please only bid if you are happy to buy victoria beckham dress. size 12. A/W18. Condition is Used. Dispatched with Royal Mail 1st Class. Jaeger wool dress size M as in photos. It could also be worn as a jumper as it is quite short. The knit on the thin side- not a heavy knit. Black Cos Dress. Long sleeves, jumper dress, perfect for spring. 100 % Wool. Hobbs UK10 Italian Wool Check Dress. Hobbs UK10 Italian Wool Check Dress.. Condition is Used. Dispatched with Royal Mail 2nd Class. DESIGNER: BODEN. Knee Length, slightly fitted and very forgiving, sits beautifully on due to the material and gives lovely shape. This item is in fabulous condition size 12. Beautiful dress by L.K. Bennett This is the Carroll style Wine purple / red wool in a midi length style Tie neck detail It’s a XS to best fit UK 8 but also ok on a smaller 10 Worn twice and in very good condition We post quickly via recorded delivery. Worn once or twice, this is a navy wool jumper dress by COS with a polo neck and short sleeves (no pockets). It's a size L, which corresponds to a UK 18/44. In very good condition with a tiny bit of pilling to the wool, no other flaws that I can find. Any questions, please ask me. Black L K Bennett wool dress in very good used condition. 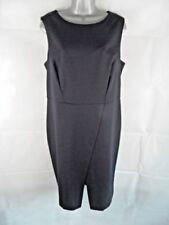 BALENCIAGA PARIS Black Grey Wool Dress 3/4 sleeve Knee Lenght Bodycone Size S. Condition is Used. Dispatched with Royal Mail 1st Class. karen millen dress 12. Dispatched with Royal Mail 1st Class. Striking karen millen dress i n size 12. Condition is Used. Size - 16L. Boden Red Wool Sheath Dress. Cap sleeves. Scalloped trim. WARM EASY WEAR. ELASTIC AT BACK PANEL ON FRONT. EYECATCHING STYLISH ROMANTIC. MAKER UNKNOWN. BOW TIE WAIST. Pale grey with small black leather strap detail. Size 14 - tried on but never worn. 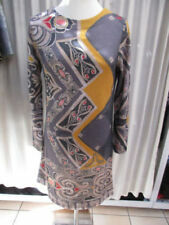 Jigsaw Ladies Tunic Dress 100% Wool Small. It does have added stretch. A quality tunic dress - blue with black/navy design. Measures 90cm (approx 36inch )from back neck to hem and 44cm across bust (34 inch bust). Condition is very good used. Dispatched with Royal Mail 2nd Class. Payment within 2 days of end of auction. Any questions please email. COS Navy Blue Wool Skater Dress with Collar size small . Condition is Used. Dispatched with Royal Mail 1st Class. Karen millen size 12 dress. Condition is immaculate. Has been dry cleaned. Elastane and acetate fabric so stretchy. Dispatched with Royal Mail 2nd Class. White Stuff Wool Mix Blue Dress Size 18. Worn once. 20% lambs wool. Nice lace effect trim around the bottom. Dispatched with Royal Mail 2nd Class. Made from both wool and polyester, this black shift midi length dress features a round neckline, sleeveless arms and back zip fastening. Great for your next smart occasion such as work! Step out in style in this NEW Austin Reed dress RRP £120. ladies pinafore dress Size 8. Condition is Used. Dispatched with Royal Mail 2nd Class. Ladies Blue Chequered Top Dress Fits Size 14. Condition is Used. Dispatched with Royal Mail 2nd Class. Very elegant and classy Ladies HOBBS dress size 10. In good condition. Fully lined. Has back zip. Outer:100% Wool. 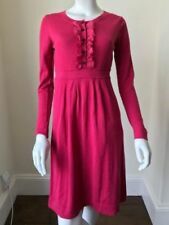 A very beautiful dress by Goat zips down the back 100% Wool (very light finely woven wool) Lined A really gorgeous fit, shaped bodice and sleeves and neckline, with a flared skirt Worn once to a Christening In near perfect condition Gorgeous GOAT Dress. Fit And Flare. Aqua. Wool Lined Size 8. Dispatched with Royal Mail 2nd Class. Cos Grey 100% Wool Jumper Dress Size XS. Condition is Used. Dispatched with Royal Mail 1st Class. Waist 28-34". Length 44". Sleeve 31". Made form both polyester and wool, this black soft touch midi length dress features a round neckline, short sleeves, patent buttons design and back zip fastening. Ideal for your next formal occasion such as work! Lovely day to evening Boden black Wool dress 8. Condition is Very good, used slightly Dispatched with Royal Mail 1st Class. Diane von Furstenberg black wool wrap dress with gold button detail size 6. Condition is New with tags. Dispatched with Royal Mail 1st Class. COLOUR - SILVER GREY. TIE BELT CANNOT BE REMOVED. BELT IS JUST TO ONE SIDE AND DOES NOT TIE AROUND THE WAIST - UNLESS YOU WANT IT TO DO SO. EACH TIE IS APPROX 38" LONG, IT CAN BE JUST LOOPED, TIED IN A KNOW, IN A BOW, TIED AROUND THE WAIST, ANYTHING YOU WANT TO DO, THERE IS PLENTY OF LENGTH. 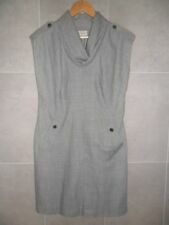 Whistles Midi Jumper Dress Size S. Condition is Used. Needs de bobbling but good condition. Pet and smoke free home Dispatched with Royal Mail 2nd Class. Lovely blue KM dress in excellent condition. 1998 ALEXANDER MCQUEEN JOAN COLLECTION PLUNGING BACK WOOL DRESS! MAGNIFICENT!